Are you the first person on your team to earn new Trailhead badges? Do you feel compelled to “drop the mic” after finishing a maintenance exam? If the answer is “yes,” we’ve got terrific news: you can now display Trailhead badges and Salesforce certifications on your Partner Community profile! ​Log in to the Partner Community. In the upper right hand corner, click your profile photo, then select My Profile. Scroll down to the 'Salesforce Certifications & Trailhead Badges' section, and click Connect Certification Account or Connect Trailhead Account. For Trailhead badges, enter the email address associated with the account that you use to complete Trailhead challenges. For Salesforce certifications, enter the email address associated with your Webassessor profile. Click Connect Account. We’ll send you an email with a verification code. If you don’t receive the email, check your spam folder or request a new code. After you get the email, go back to the Work & Experience section of your profile. Select the two checkboxes for showing Salesforce Trailhead Badges and Certifications on your profile. Now, Community Members can see the badges or certifications that you’ve earned whenever they visit your profile! Reach out to us on the Q&A Group (Partner Community login required) if you have questions. Want to add another badge to your collection first? Head over to the Trailhead website. Or go big and sign up to get Salesforce certified. 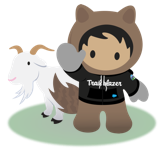 Be sure to check out the new enhancements on the Partner Community that enable you to track your Trailhead and Certification progress. Learn more here.